A traditional home vs. a casual home. 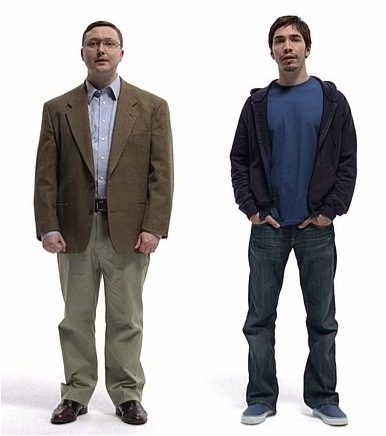 Have you seen those Apple vs. PC ads on TV? As this article that a friend sent me remarks, part of these ads’ success lay in pitting casual (Mac) vs. traditional (PC). Here’s the kicker: far from being limited to clothes or computers, the appeal of casual has also extended to homes. Once the realm of condos, open-concept rooms now abound in detached homes. Gone are stuffy, formal living rooms and rarely used dining rooms. They’ve been replaced with large, family-friendly rooms that you can use for pretty much anything, whether it involves watching TV or eating or playing. The reasons are twofold. First, 9/11, which reduced travel frequency for most people. Second, the recession, which made people entertain at home more often rather than go out. As a result of these two factors, homeowners now prefer homes better suited for spending quality time inside. This doesn’t just mean open-concept rooms but also more covered areas in the back and decks for them to host BBQs, blurring the separation between outdoor and indoor living. Of course, this isn’t set in stone. Whether you choose to build homes that are traditionally designed or homes with open-concept designs depends to a large degree on location and target demographic. But you should at least be asking yourself this important question: are you 100% certain that this community’s homebuyers want traditional, separate rooms? Previous Summary of Changes Introduced in the 2012 Ontario Building Code Next What do Technologists Have in Common With Marketers?